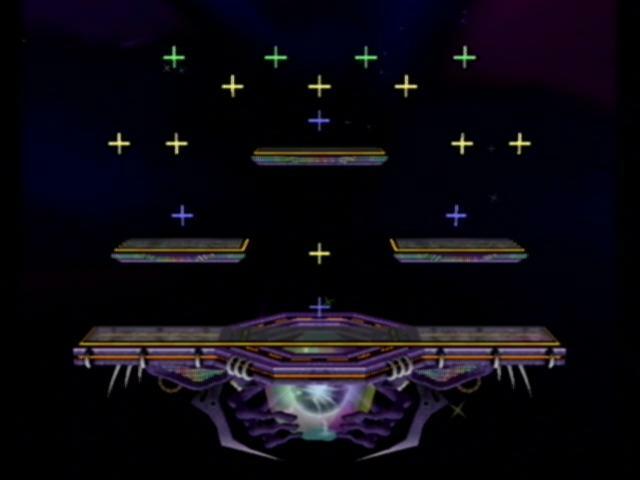 These stages are used for all main game modes. Some single player modes have special stages not playable in versus mode. Notice: the + marks in the stage images are not in the actual game, they represent points on the stage where players will spawn after being KO'd. 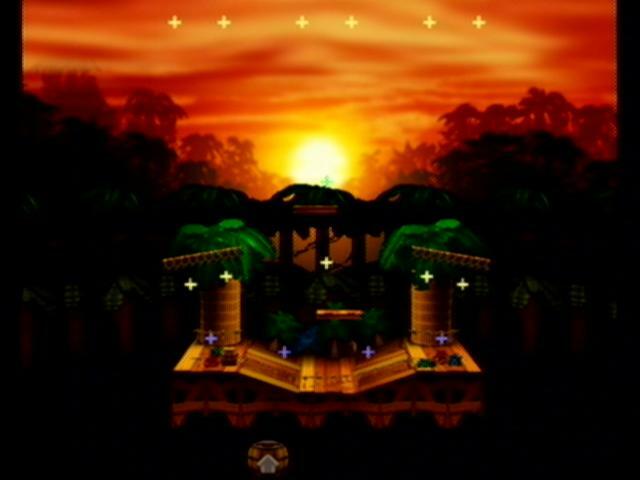 These stages are all selectable from the beginning of the game versus mode, and are played throughout the one player modes as well. A level from super Metroid, based off of the old N64 stage. There is a large main platform, two side platforms, and a top platform. Also, yellow acid will rise every so often, knocking players up. Although the acid never entirely subsides, you can still die if it is at its lowest level. Occasionally, the acid will rise all the way until only the top platform is safe. The little organic things in the main platform are attackable. 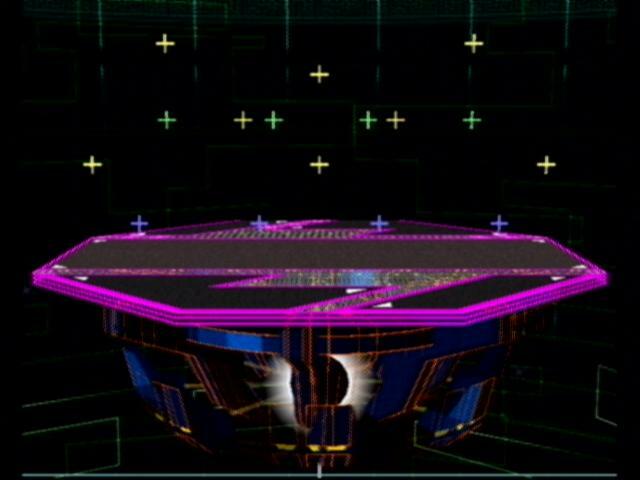 If you attack them enough, the main stage will split in half, making the entire stage bigger. 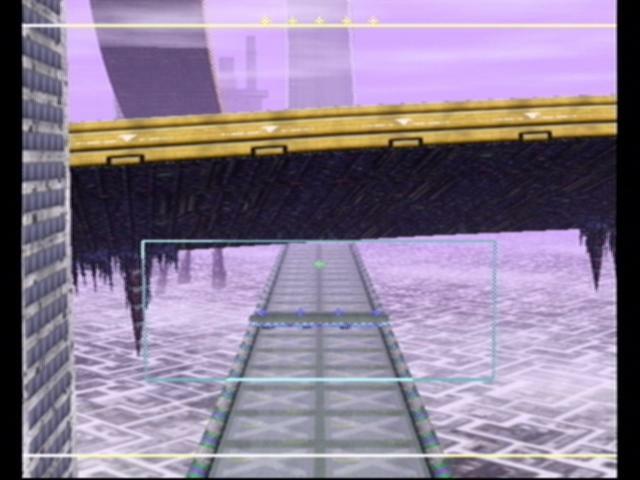 Also, the slimy binds holding the side platforms to the main stage are attackable, and when one is destroyed, the side platform will snap up to about 60 degrees. Probably the most popular stage, you fight along the Great Fox from the Starfox games. It has two main areas and no permanent floating platforms. The main fuselage of the great fox plus the wing makes the main platform, which slopes up to the right. The smaller platform is on top of the engine, and is lower than the main platform. occasionally, Arwings(the little fighters) will swoop in and shoot lasers, serving as temporary platforms. The engines also cause damage. They move slowly for a few seconds, then swoop off. 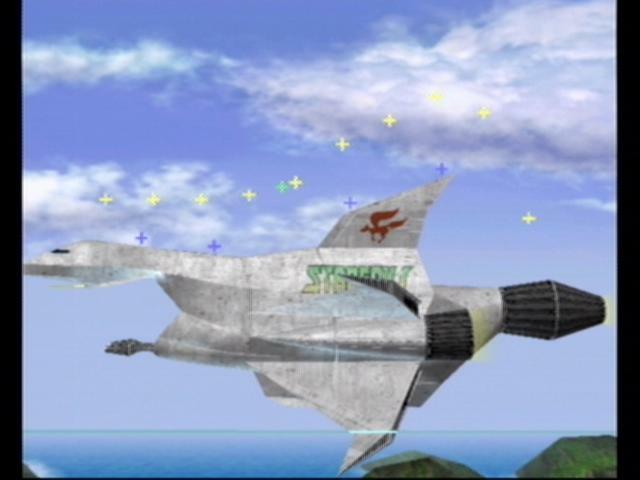 If you stay on the platform, you will die when the Arwing goes off the screen. Also, the big lasers in from the Great Fox will charge every 30 or so seconds. When they are charging, it acts as a temporary platform. Then, the big laser will fire straight ahead, ko-ing anyone trying to recover from that side of the map. It can be destroyed for the entire match, purposely or accidentally. Like Corneria except from the front view. There are four main wings arranged in an X around the body that act as sloping platforms that you can drop through. Arwings and Wolfens still occasionally come along the side of the ship. 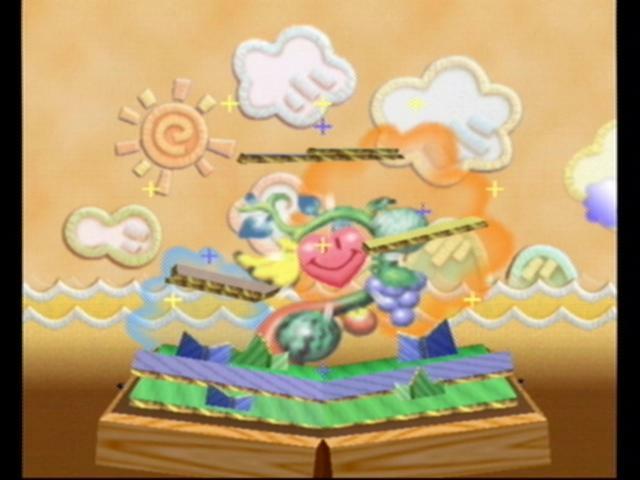 A stage from the Kirby games. Its a basic flat stage with three floating platforms arranged in a pyramid shape. The bottom two slowly float up and down. The bottom flat part is reflective. There are no hazards in this stage. A Raikou on this stage is the bane of any opponents you may face. Taken from the game Majora's Mask, it is set on a floating platform off the coast of a shore. There is a large platform with one platform below on the left side and one platform below on the right side. 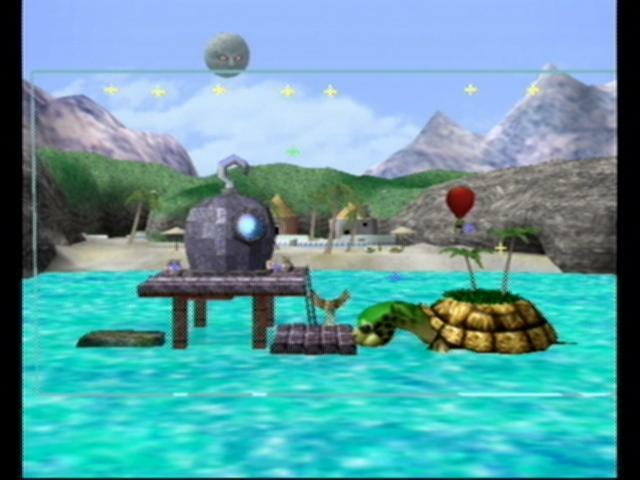 Often, on the far right side of the stage, Turtle that can be used as a platform, along with the two short trees that accompany his shell. Tingle also floats above on his balloon, which you can stand on or burst, leaving Tingle in midair for about 1 second flapping his arms and legs (which will damage you) before falling to the ground, dance idiotically, holding up his pen and map, only to inflate his balloon again about 10 seconds later. He can be eliminated for a short time by popping his bubble over the water. The Moon in the background, destined in the game Majora's Mask to fall on Clock town can be seen falling during the battle, only to be stopped by the four Giants, and pushed back up. This happens only once in a battle. Music is what is arguably the theme song for The Legend of Zelda. Alternate music is Saria's Song from Ocarina of Time. A trick to instantly KO an opponent is to wait on one of the two lower platforms (the one on the right is best though) near the inner edge. Grab another character and throw them near the main platform. In most cases, the backward throw is the most effective, but in others (like with Link and Young Link), the forward throw is best. 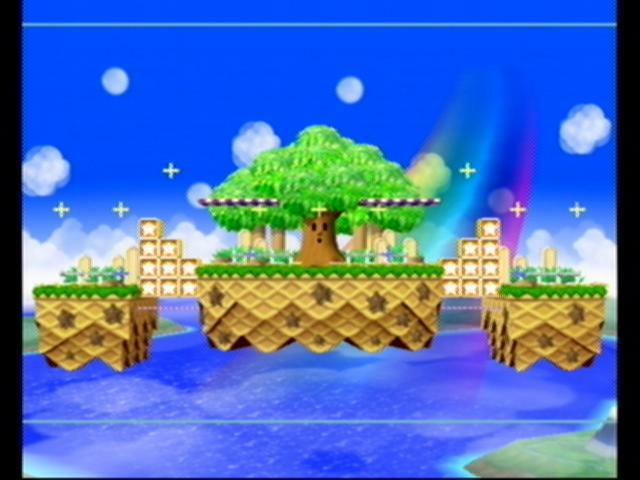 Kirby's main stage, Whispy Woods (the big tree) in the middle of it with a platform at its roots and two smaller platforms to the sides at the same level. The gaps between these are filled with star blocks and bomb blocks that fall from the sky. Bomb blocks explode, so you can shoot a projectile to blow them up on an opponent. Whispy Woods will blow either left or right sometimes, pushing all the players that direction. He also drops apples that can be used as projectiles or healing. The biggest stage in the game. It is a big ruined temple floating in the sky, with a main platform to the left, A big platform to the right, and a "basement" underneath the left platform. On the left platform, there is a small gondola to the very left and a stage above the middle of it. In between to two top stages, there is a tunnel leading to the "basement". the "basement" has a small hanging platform to the right, as well as a path up to the middle of the left platform. The right platform has a three tier platform to the extreme right, and a smaller platform above it in the middle. This stage has no hazards. This stage comes from Zelda II: The Adventure of Link, as does the music. This level, based on the NES game Ice Climber, constantly scrolls vertically, challenging players to fight and try to keep in the center of the level to avoid KO. The map will scroll upwards slowly, medium fast, super fast, or very slowly scroll down a bit. The level layout will loop if played long enough. The alternate music is the Balloon Trip theme from Balloon Fight. Cranky Kong's hut on top of a raging river. The river moves fast to the left, so getting caught in it is usually instant KO. Escape IS possible, however; if your reflexes allow it, you can quickly double jump back to the platform, especially if you're playing as someone with high jumps like Luigi. There is a small platform to the left, and a main platform in the middle, with another small one to the right. 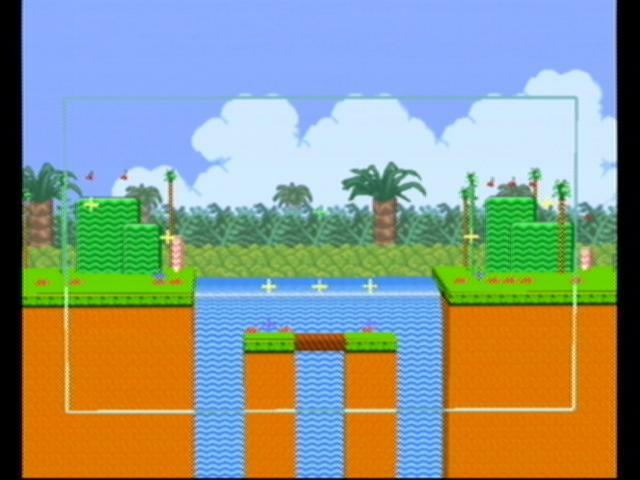 Also, Klaptraps (little blue alligator things) will jump out of the river and meteor smash players in, KOing even at 0%. You want any hope of living, just avoid it and keep a sharp eye, as it is a spike (you can't meteor cancel it). Mini easter egg: A level 9 Ness in the P2 slot will immediately self-destruct at the beginning of the match if the only other player is in the P1 slot and does not move. Lastly, this stage is infamous for exploiting CPU bugs. No for multiple reasons. The most significant ones being, the raging river and the Klaptraps, for the reasons listed above. Also, said hazards are very easy for tournament players to exploit, especially the former. Finally, thee ceiling is immensly high (one of the highest in the series), meaning it forces an extreme reliance on horizontal KOs, putting characters who lack horizontal KO moves like Young Link at a severe disadvantage on this stage. 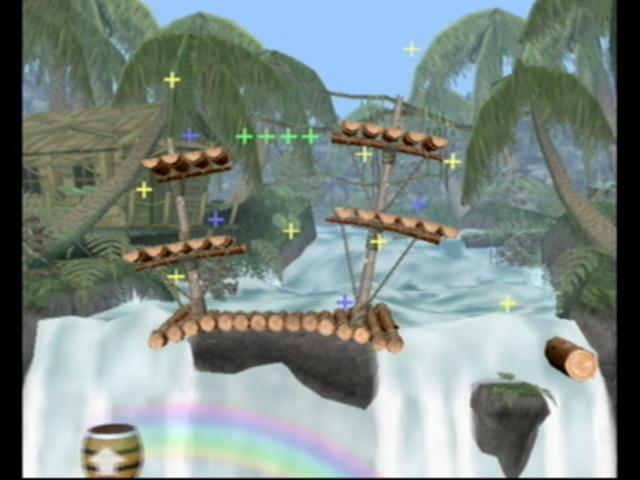 This Donkey Kong Country stage features characters fighting on a raft stuck in a waterfall in the middle of the stage, with little platforms suspended above it. There is a rock jutting out on the right side, which serves as a platform. Underneath the stage, there is a moving, rotating, barrel that shoots out people that jump into it in the specified direction. Good for recovery, if you can time it right. Once in a while, a log can flow by and be used as a temporary platform. This stage is notable for it's music. It's the first stage in SSB history to use fully vocalized music as it's theme. As a plus? Said music is ALSO the famed DK Rap from Donkey Kong 64 (with a few differences, like "hell" being changed to "heck" in Chunky Kong's verse). A big hazard is the Klaptraps. They're just as annoying here as they ever were, being able to KO as low as 62%. Every once in a while, they'll fall in the barrel cannon and hog it. Rarely, they'll be shot out of the cannon, and in the event this happens, they tend to KO everyone in the middle, so stay out! Counter moves can save you from being KOed in this senario, so if you have one and you see someone getting shot out when you know your foe isn't there, use it! No. In additon to it's somewhat small size, the rock at the bottom left can save a foe from being KOed by a meteor smash that otherwise would have KOed them, and the rock can potentially allow stalling, which is illegal in serious play. Finally, the Klaptraps are too powerful of stage hazards. A classic Mario level, with two chasms in the main ground. The chasms have those little yellow drop platforms in them. In the middle breakable brick blocks with a few item blocks serve as platforms. Occasionally, all the bricks on the stage will turn into item ? blocks which give items when you break them. No. 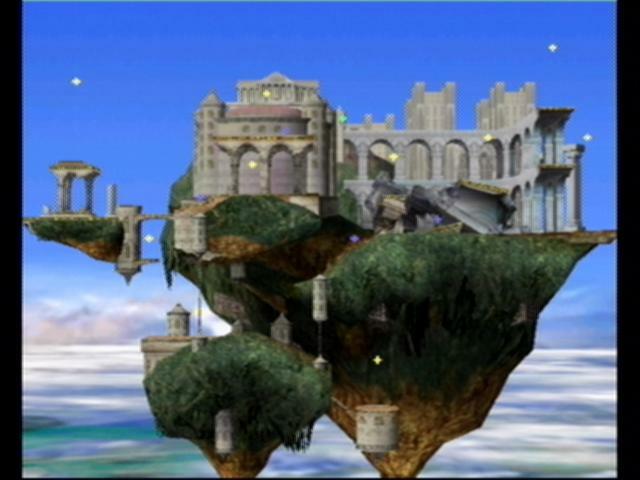 This stage is currently illegal in all rulesets, as the lines are walk-off, leading to extra-early KOS, the moving platforms, the inconvienent design allowing for caves of life, and it's high ceiling, causing many to survive vertically over 200% damage. Another F-zero stage. A movable platform runs along the track, where cars race towards the screen. There are three platform configurations that change, one with just a big platform, another with a 3 platforms, and another with 2 bent platforms and a rotating platform in the middle. The platforms move fast along the track, stopping for about 15 seconds in different places. When they stop, cars will race along the actual track, causing damage. The F-Zero Racers can explode if hit correctly. 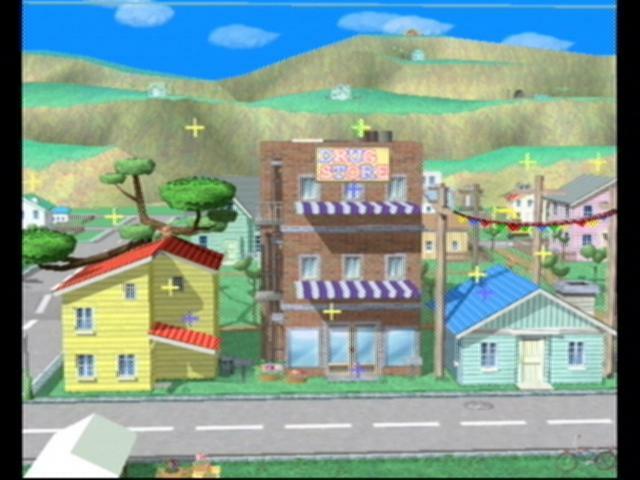 A EarthBound stage set in Ness' hometown. There is a house in the middle with two awnings, a shorter house to the side with a banner above it, and another house to the left with a tree on top of it, and a road running along the bottom. Cars will drive by on the road, hurting people who are on it. The awnings in the middle will collapse, but come back up after a while. The platforms in the tree bounce. A big flat stadium with two small platforms above on each side in its normal state. 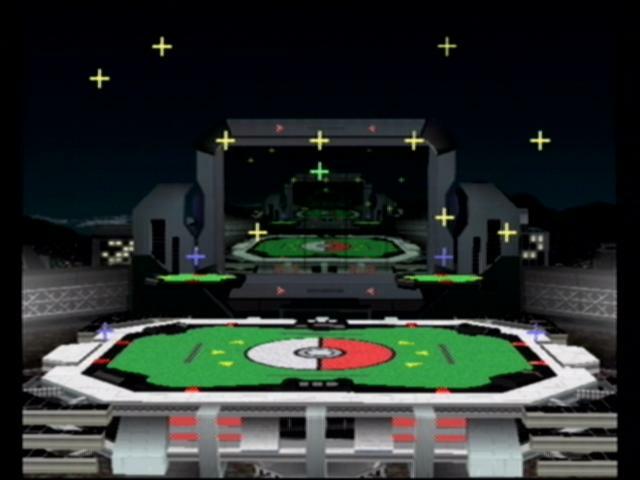 A large screen in the background has stats or closeups of the battle. 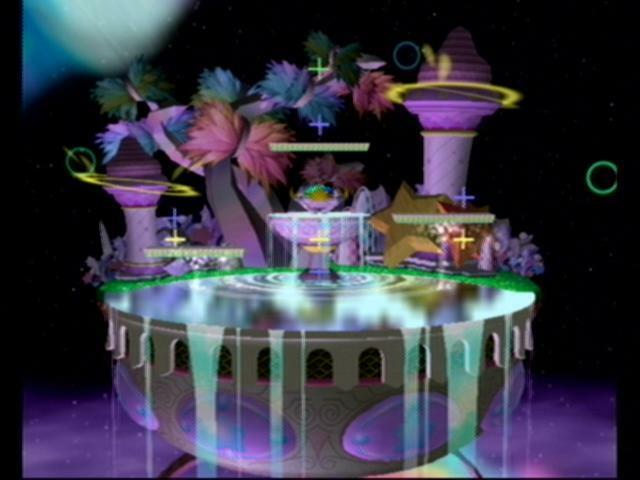 every 30 seconds, the stage will change into a Rock-type, Fire-type, Water-type, or Grass-type stage, with different platforms. A Mario level from Super Mario 64. 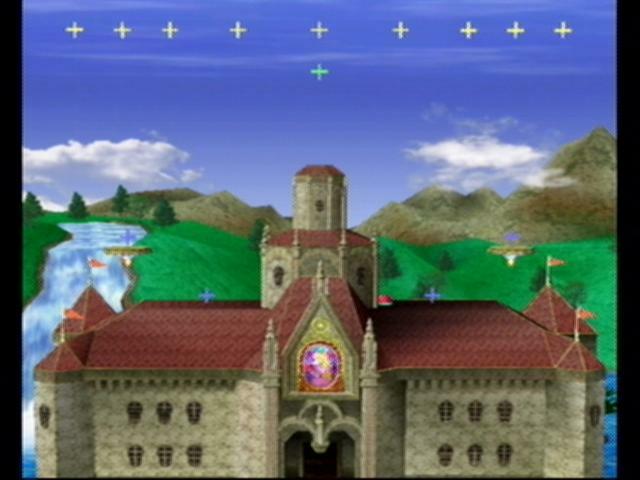 Set atop a scaled down Peachs' Castle, the big center part of the castle forms a high platform, and the roofs of the side make other platforms. Once in a while, little colored switches on the ground will activate more platforms and make item blocks. Also, A Banzai Bill with burrow into the side of the castle every so often, and make a giant explosion. In total, Banzai Bill will do around 35-40% damage, and if unlucky enough to be caught, you are virtually guaranteed to die, even at 0%. No. It isn't allowed in tournaments, in large part due to how easy comboes are in the center, and, obviously, Banzai Bill. Another looping stage like Poké Floats, though not as complicated. You start off in a flying ship, which travels to a series of platforms, which leads up and over until you get back to the ship again. It can get hard to keep up with the screen. 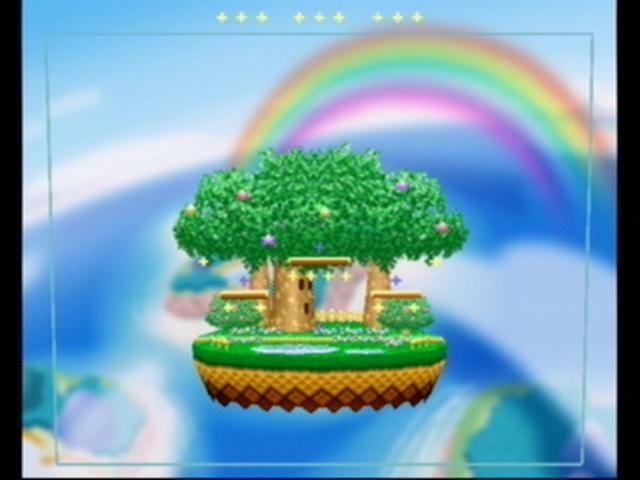 This stage was based on the Rainbow Ride stage from Super Mario 64. Bowser is fought here in the first All-Star event match. Often this stage is less about fighting and more about trying to survive! No. Early on, yes, as a counterpick. It scrolled fast, but not imposible-fast. But, as of now, no. The paths are somewhat complicated, there are disapering platforms that can score premature falls, and the camera definetly didn't help. In addition, characters with incredible aerial prowress, like Peach, have a huge advantage here due to being able to stay ahead of the opponent. Lastly, due to the often-complicated platform structure, characters with poor recoveries like Roy do just plain awful. Taken from an area of the same name in Super Mario World, it is complete with the infamous square blocks that spin if hit from the Mario universe. The level is a piece of land that is connected by a pit covered by three of the said blocks above. At the right there is a large hill that leads up and eventually off the map, and on the left is a large pipe (which cannot be entered.) that make up another hill with it's diagonal placement, making the level a bit of a valley. Music is the high elevation music in Super Mario World. Alternate music is an improvement on Super Mario Bros. 3. The hill on the right is close to the blast line. A throw or a dash attack while magnigied should KO instantly. 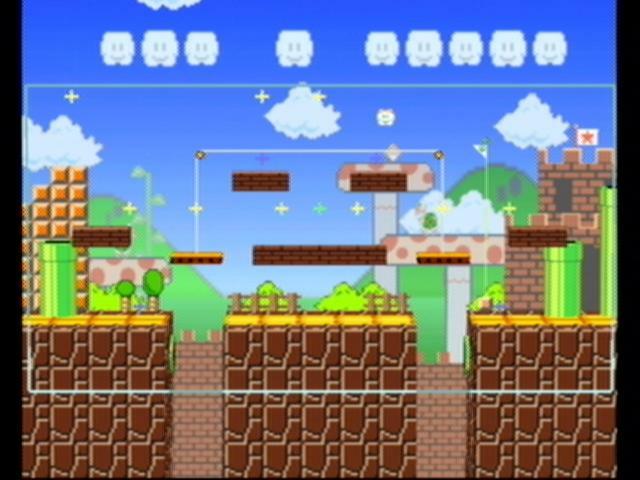 With nearly the same platform arrangement as the Battlefield stage only noticeably smaller, the only interactivity is a cloud that runs on a track that goes back and forth between the left and right sides of the main land, and flying Shy Guys called Fly Guys that sometimes carry Food that they will drop if they are KO'd. Music is the theme song from the critically-panned game Yoshi's Story. These stages can be selected once unlocked through special requirements. The unlock requirements are listed below as well as the description. Along with Poké Floats, this is one of the hardest stages. It is a large rotating mass with two platforms hovering around it. Kraid (a boss from Super Metroid), appears in the background and will spin the stage around every 10 seconds or so. other than that, there are no hazards on this stage. Kirby and Jigglypuff will do best here. Play 50 Versus Mode matches. In order to view the number of VS. Mode matches that you have completed, go to Data: Melee Records: Misc. Records. In the seventh row will be "VS. Play Match Total." The big town from the game EarthBound. There is a building to the left with a movable crane platform on top of it, A two tiered building in the middle, and a smaller building to the right. 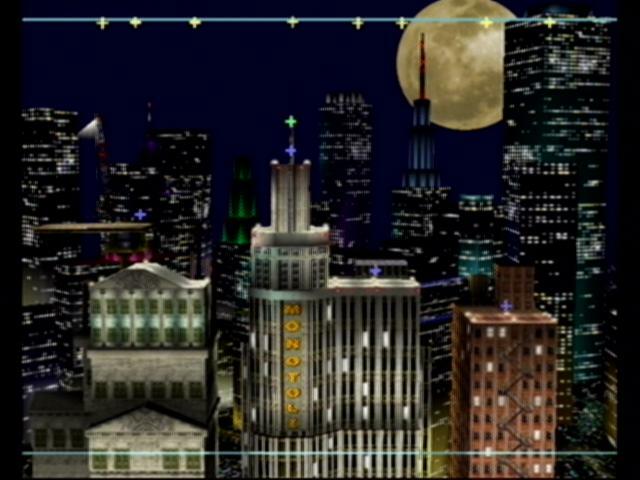 Also, a slippery UFO will appear above the right or left building occasionally acting as an extra platform. The gaps in between the buildings are very hard to recover from, especially for Ness, so knocking people down these is a good strategy. 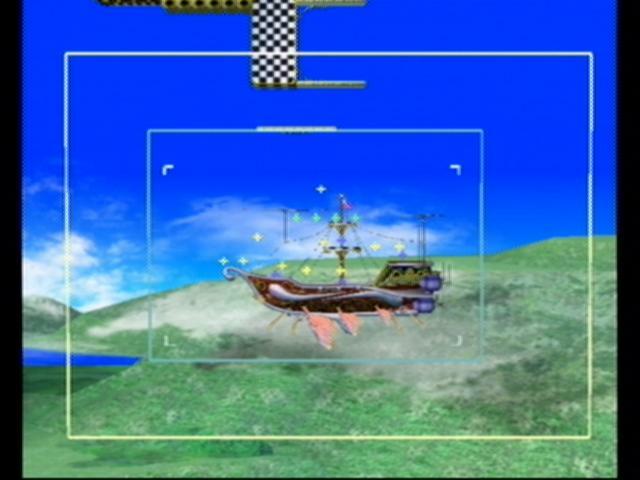 Starting on Captain Falcon's ship, the battle takes place on the F-Zero Racers and various platforms as they race across the Big Blue level. The level is rapidly scrolling, standing on the floor too long could mean death, and objects that float in the air (Like Flippers, Party Balls and some Pokémon) will likely be swept off screen before being of any use. Other platforms, such as the Falcon Flyer, will occasionally enter. Play 150 Versus Mode matches. Taking place over the Kanto mainland from the Pokémon series, players battle on rather large Pokémon floats like those that might be seen in the Macy's Thanksgiving Day Parade. The stage scrolls from one float to the next, forcing players to jump to each float or risk falling out of the sky (and off the stage). Half of one's energy is often spent on survival. The floats cycle in this order: Squirtle, Onix, Psyduck, Chikorita, Sudowoodo, Weezing, Slowpoke, snorlax, Porygon/unown, then back to squirtle. Note: One of the above 4 courses is randomly unlocked every time you play 50 VS matches. Results may vary. A Super Mario Bros. 2 level, contrary to what the name sugggests, with two high platforms on either side, and a lower platform in the middle, separated by waterfall chasms. Birdo will come out on the right side occasionally, and shoot eggs. These eggs can deal up to 28%, and can KO very early to boot. Also, a little flying carpet with a Pidgit will appear in the air as another platform. Logs will also appear from the waterfalls as very temporary platforms. 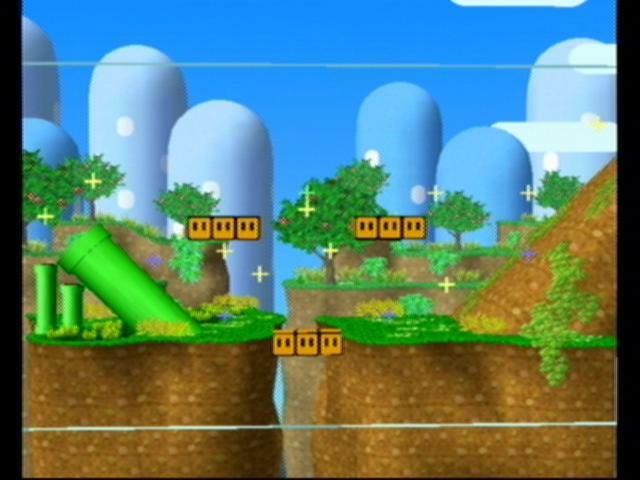 As with the other Mushroom Kingdom stage, the blast line is very close to the edges of the stage. Throws are good for easy KOs. Obtain the Birdo trophy. It can be obtained by the Lottery or found in the Classic and Adventure Modes. Plus, when starting a new save file, you automatically get a trophy, with the Birdo trophy being a possible selection. No, for basically the same reasons as the Mushroom Kingdom 1 stage, plus, there's the fact Birdo is generally seen as too powerful of a stage hazard. An extremely small level that integrates features and designs from the classic Game and Watch games Helmet, Oil Panic, and Manhole. All characters are two dimensional (but it's hard to discern), and pausing here will zoom out to view the entire Game and Watch system (as opposed to zooming in on your character). All characters save Mewtwo make Mr. Game & Watch's distinctive clicking noise when they walk. Occasionally a whole bunch of random tools with drop down from the top of the map, causing a lot of damage. Also, a guy will spill oil on the bottom of the stage, reducing friction. The platforms will change often. If there is a person hanging from one, it means it will change. People can be thrown, egged, or spit off the edge. Complete Classic, Adventure, or All-Star Mode with Mr. Game & Watch on any difficulty, without using a continue. The following two stages are usually the last unlocked, and serve as the primary "arenas". Plus, both are satysfying to look at. The stage from all the Multi Man Melee modes. Classic pyramid structure, no hazards. Complete All-Star Mode. To get All-Star Mode, you need to unlock every character. The stage from the last event match. Big flat stage, that's all. Good level for inexperienced players. Clear Event Match #51: The Showdown. To reach this event match, you'll need to clear all 50 other Event Matches. Stages from Smash 64, carried over to Melee. Also unlockable. 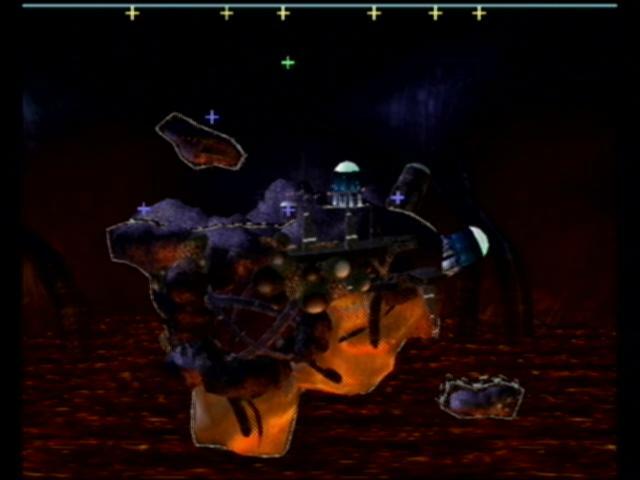 An old stage from the N64 version, this Kirby themed stage has the pyramid structure of platforms with Whispy Woods in the background. He will occasionally try to blow the players off of one side or the other. Complete Target Test with all twenty-five characters, including the unlocked ones. 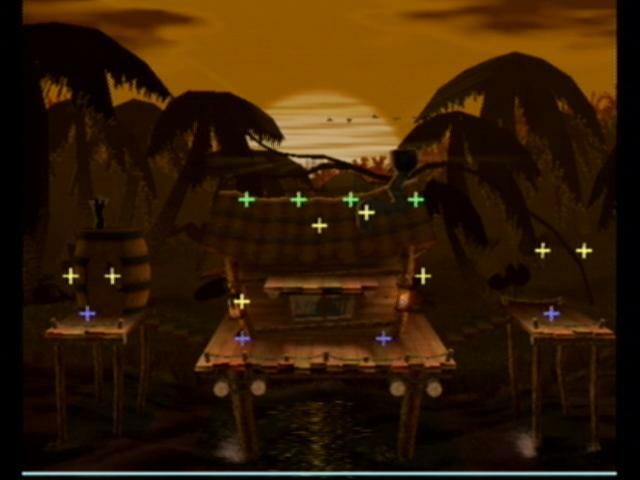 The original Kongo Jungle from the N64 version, with movable platforms and a barrel cannon. Clear the 15-Minute melee with any character. 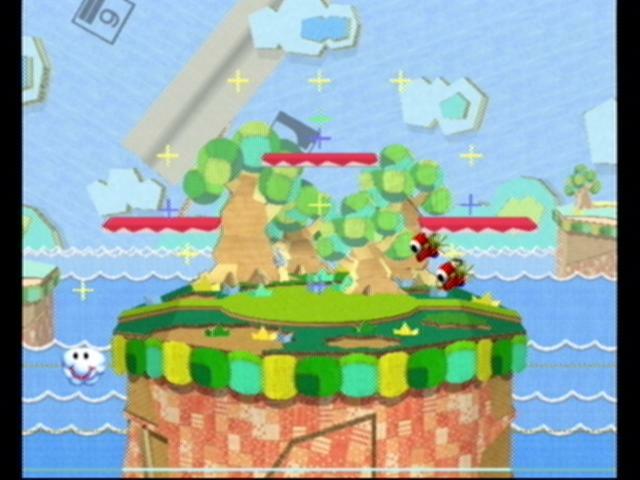 The actual Yoshi's Island stage from the old version. Pretty much the same, except it looks different and uses a cloud that'll move from one side to the other and back through the bottom of the level. Hit the Sandbag over 1,312 ft (400m) in the Home Run Contest. An easy way to do this is with Yoshi: Grab the bat, jump over the Sandbag and use your airborne Down+A attack to inflict massive damage to the Sandbag. Repeat as much as possible before hitting a home run. 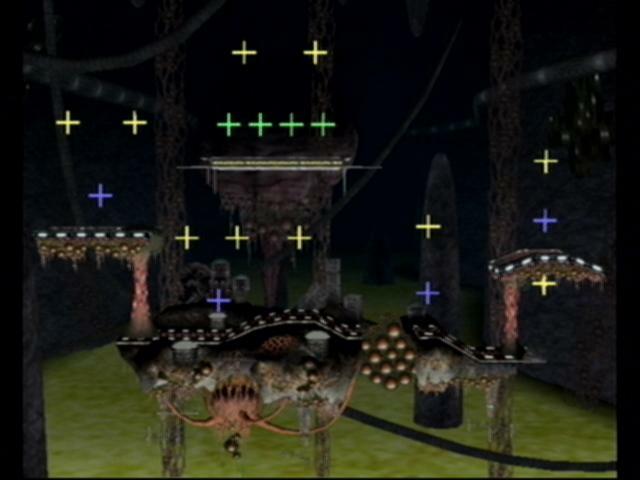 These stages are only found in certain circumstances, and cannot be played in Vs. mode unless Debug mode is used (Note: Goomba, Entei, and Majora's Mask cannot be played even with debug mode, though they can be via other hacks). None of these names are official. This page was last edited on 3 November 2015, at 01:38.